The UK's richest people have defied the double-dip recession to become even richer over the past year, according to the annual Sunday Times Rich List . The newspaper's research found the combined worth of the country's 1,000 wealthiest people is £414bn, up 4.7%. It means their joint wealth has passed the level last seen in 2008, before the financial crash, to set a new record. 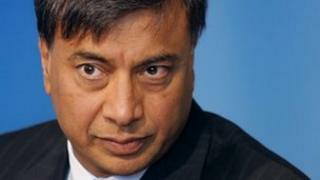 Top spot for the eighth straight year is held by Indian steel magnate Lakshmi Mittal, 61, with £12.7bn. There are now 77 billionaires on the list, with individuals needing to have at least £72m to make the top 1,000. The richest billionaire of all, Mr Mittal, retains his position despite seeing 27% of his family fortune wiped out in the last 12 months because of a drop in the share price of their steel producing business. The Mittal family have held the number one spot in the list since 2005. Lakshmi Mittal and family - £12.7bn. Sri and Gopi Hinduja - £8.6bn. Ernesto and Kirsty Bertarelli - £7.4bn. The Duke of Westminster - £7.35bn. David and Simon Reuben - £7.08bn. John Fredriksen and family - £6.6bn. Galen and George Weston and family - £5.9bn. Another person who has made money from the metal industry, Arsenal shareholder Alisher Usmanov, is second with £12.3bn, while Chelsea owner and oil baron Roman Abramovich is third with £9.5bn, despite being £800m down on last year. The richest woman is former Miss UK Kirsty Bertarelli, who shares a £7.4bn fortune with her husband Ernesto, while the Duke of Westminster's property portfolio makes him worth £7.3bn. Several leading British entrepreneurs, who are further down the list, have seen their wealth increase this year. Diamond retailer Laurence Graff's wealth has risen to £3,300m while Sir Anthony Bamford, owner of the JCB earth-moving machinery firm, has seen his fortune go up to £3,150m. Inventor Sir James Dyson, who created the bagless vacuum cleaner, has also seen his wealth increase, to £2,650m. Some of Britain's best-known performers and artists have also seen their fortunes improve. Sir Paul McCartney's recent marriage to his third wife Nancy Shevell, who is the daughter of an American trucking magnate, sees him become the third wealthiest man in British music, as their combined wealth is now rated at £665m. The two people surpassing him are music executive Clive Calder, who is worth £1,350m, and theatre owner and producer Sir Cameron Mackintosh, whose fortune has gone up to £725m. Harry Potter creator JK Rowling's worth has risen by £30m in the last year to £560m, putting her 148th on the list, and a new addition to the list is London-based founder of the Spotify music website Daniel Ek, ranked 395th with a fortune of £190m - the same amount as David and Victoria Beckham.